Moto2 test: Elias quickest as testing moves back to Jerez. Former Moto2 world champion Toni Elias lead the way on day one at Jerez with his lap of 1m 43.365 on his Blusens Avintia – a surprise for many who were expecting Pol Espargaro to get back to business as usual as he was the pace-setter the last time Moto2 tested at the track in February when he set the quickest time of that test with a 1m 42.332. This four day test for the class is the first time the teams have been allowed to use their official Moto2 race engines, with the teams using their own engines during winter testing up to this point. Elias’ fastest time from the final session lead in a slew of fast Kalex bikes in the close to ideal weather conditions, with the top six positions being dominated by the manufacturer. The top three was completed by Pons Kalex riders and team-mates Tito Rabat and Espargaro, second placed Rabat was just 0.059 behind the fastest time after leading the opening session. 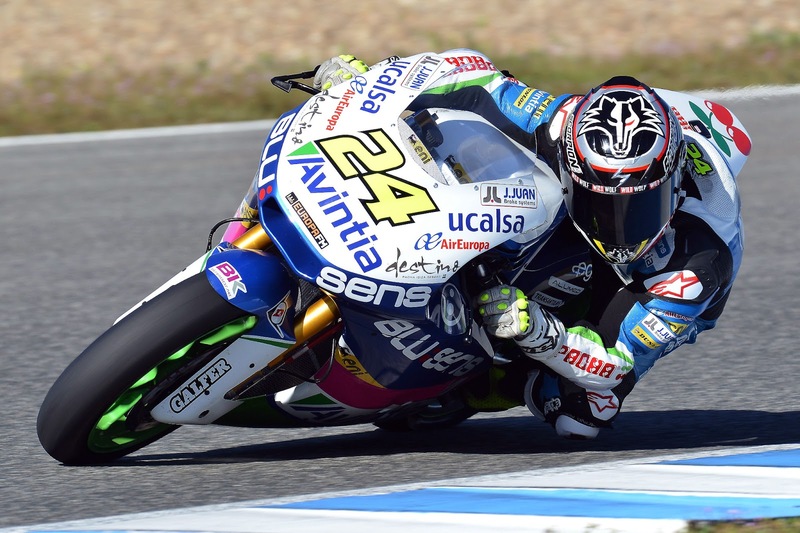 It is the first occasion the Tuenti HP 40 rider has finished a testing day ahead of Espargaro. The Italtrans pairing of Takaaki Nakagami and Julian Simon were fourth and fifth fastest ahead of fellow Kalex rider Mika Kallio for Marc VDS in sixth. The first non-Kalex bike on the timesheets was NGM Mobile Forward racing’s Alex De Angelis who placed his Speed Up machine in seventh, just ahead of the fastest Suter, Nico Terol for Aspar in eighth. Filling the remainder of the top ten fastest places on day one were Frenchman Johann Zarco in ninth for the Came IodaRacing Project and Xavier Simeon in tenth for the Desguaces La Torre Zelos team. The second session was a very tight affair with the entire top 14 within a second of each other, British title hopeful Scott Redding was the best-of-the-rest in 11thfor Marc VDS, ahead of QMMF’s Ant West in 12th, Espargaro and Rabat’s fellow Tuenti team-mate Alex Pons in 13th and Swiss rider Dominique Aegerter for Technomag in 14th. Louis Rossi finished the day down in 27th for Tech 3 after losing control in the final sector of the track and sustaining heavy damage, though the Frenchman walked away unhurt. His British team-mate and class rookie Danny Kent was 19thquickest on day one . Fellow Brit and partner to leader Elias, Kyle Smith, was 24th. Sergio Gadea, who replaces the recovering Tom Luthi at Interwetten, finished the day 29thfastest out of a 32-strong line-up.